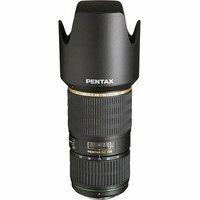 The Pentax DA * 50-135mm F2.8 ED (IF) telephoto zoom lens is designed for exclusive use with Pentax digital SLR cameras, delivering the highest level of ultimate optical image quality. With aspherical elements, special optical-glass elements and original lens coatings, this lens is superior in terms of contrast, clarity and edge-to-edge sharpness. The 50-135mm features tightly sealed, weather-resistant and dust-resistant construction to enhance durability for use in rain or dusty conditions. A new SDM system has been incorporated for smoother, quieter autofocusing operation using a built-in supersonic motor.